A finish! Nr. 6 on my list of proposed finishes for this quarter is done and gifted. #happy The baby girl Felia born in January; daugther to a friend of mine was already waiting for her quilt. The up’s and down’s of this quilt are quite a story. It started in 2010 with my first patchwork class. I enjoyed the class and the pattern but due to my lack of sewing routine, it was ignored for quite a while and almost discarded because I did not like the colors anymore. I pulled it out of my pile of WIPs to practice in February 2014 when I bought my real sewing machine. Still it never made it to the top of my list. When I found out later in the year that my friend was having a baby girl, I remembered these orphaned blocks. My friend likes purple and I was curious if she would like to have this project as a baby quilt. It would not be a surprise then but I am currently more comfortable with knowing if I am on the right track beforehand. Besides of looking totally not like my vision at all, I ran out of thread in the middle of one side. After some more days delaying the inevitable, I started to rip out all my quilting in the border – almost all three sides. Two hours later I had a sore neck and a million purple-magenta quilting thread pieces on my couch. In the end I went with the straight line and liked that a lot better. As a nice embellishment I added the baby girls first letter and a princess crown in one corner. And I used the first one of my new labels on the back of the quilt. PS: To keep it real. The embellishments have been a I need to fix a problem add on. The top and border separated at that seam after washing – no idea why. Maybe the fabric shifted while sewing and the seam allowence was off? Or I stretched it too much while basting and the seam broke? I did not want to unpick all quilting of the border and the binding again, so I fixed the „hole“ this way. Keep your fingers crossed that it will hold now! 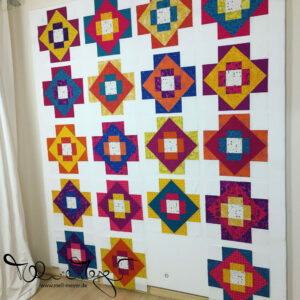 Linking up at WIP Wednesday @ Freshly Pieced. Love the colors and wonky stars! 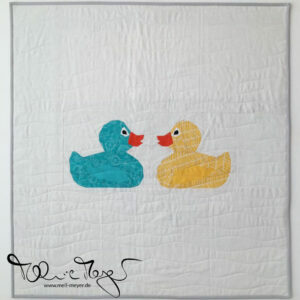 This will certainly be a well loved and treasured quilt! 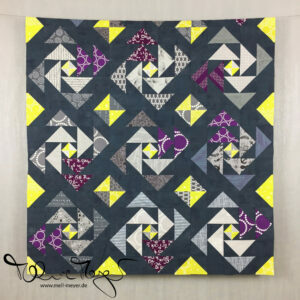 I really like this quilt and your color choices. It’s gotta feel like a nice accomplishment to check an abondoned WIP off your to-do list… especially with so many seam ripper moments. Love the wonky stars and border. I absolutely LOVE this…and I don’t even like purple! Nicely done.